Metabolic reprogramming in macrophage polarization. LPS and IFN-γ induce M1 macrophages. Metabolism in M1 macrophages is characterized by increased glycolysis and PPP activity, and a broken TCA cycle that leads to metabolite accumulation. 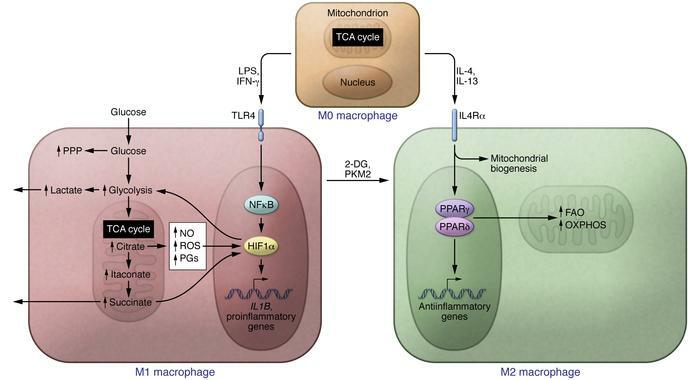 M2 macrophages display a more oxidative metabolic profile, with a high reliance on the TCA cycle, utilizing OXPHOS and exhibiting high levels of FAO. Inhibition of glycolysis by 2-DG leads to an oxidative M2 phenotype (48).